We accept 15 & 30 hours funding for 2,3 and 4 year olds. For a full price list please contact us. Below are the latest reviews for LAngels. Please note that reviews represent the subjective opinions of other Childcare.co.uk users and not of Childcare.co.uk. Parents must carry out their own checks and references on childcare providers to ensure that they are completely happy before enaging in the use of their services. The setting and staff are wonderful. Well equipped for all children development needs. Staff are fully engaged to help progress your child’s abilities and form new ones. 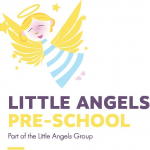 My little boy (3 years) attends Little Angels part time - he started there after we had a really hard time settling him in a nursery so we gave Little Angels a go and from day 1 it was a marked improvement - no meltdowns leaving him there which was an issue at the nursery. The staff at LA are all lovely and really fantastic with the kids and the activities they do are brilliant - so creative and a great variety of things to do so they never get bored. It is a really good setting - lots of space indoors and outdoors and a safe and fun environment for little ones. So glad we found Little Angels - we have a very settled and happy boy there.